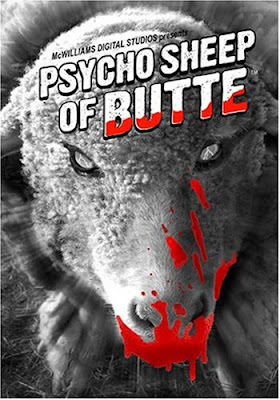 Now here's my nomination for Most Ridiculous Montana Movie: Psycho Sheep of Butte. An extremely low-budget effort by a couple of Bozeman filmmakers, Psycho Sheep is a campy sci-fi horror parody ... with a storyline including space aliens and time travel, as well as carnivorous sheep and the Berkeley Pit. Maybe not the quintessential Butte film, but it definitely fits. The movie is more than a little uneven, and you have to be in the right frame of mind to appreciate it, but it worked for me. I actually have a Psycho Sheep T-shirt, something that's guaranteed to draw attention wherever I go! Thanks for the laugh! That's TRULY funny. It's definitely pretty lowbrow entertainment ... and again, probably not for everyone's taste. But if you're in the right mood, it's worth it -- so keep an eye out! Alright...where do I get a copy? I have a friend who was/is a Bozeman filmaker...and have sent him this reference. BTW, I know why the sheep went pyscho! They drank from the Berkeley pit!! And you can actually order it from Amazon ... the filmmakers also have a website at www.psychosheep.com.